This parish, which is half way to everywhere, stretches along the central section of the north coast. The airport, the harbour and St Helier are all within an easy 20-minute ride. 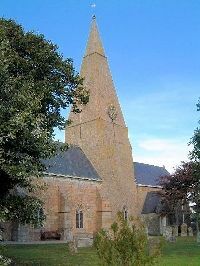 Largely a rural community, the parish has a good local shopping area (grocer, post office, pharmacy, sandwich/coffee bar, medical surgery, hairdresser and kitchen design shop) around its parish church and parish hall. There is also a sports centre but it needs modernising and plans for its future are now causing heated debate in the local community. The parish is the first in the island to have its own rubbish recycling scheme. There is a combination of publicly-financed housing, new privately-financed developments, reconverted old farm houses, a few graceful Georgian mansions and an important manor house with its beautiful garden. Farming is still the principal activity, with potatoes and maize as the main crops. The north coast drops steeply to the sea but the only beach of any note is the small but sheltered Bonne Nuit, which doubles as a small fishing harbour.